Shipping Costs: Your Shipping Price: $0.01 for all Leatherworks product orders to be shipped within the main contiguous USA only. All order within the Continental United States are shipped via Fed Ex ground. 3-day or 2-day shipping available for an additional charge. 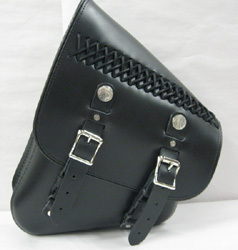 COD Orders: At this time we can not accept COD orders for Leatherworks products. 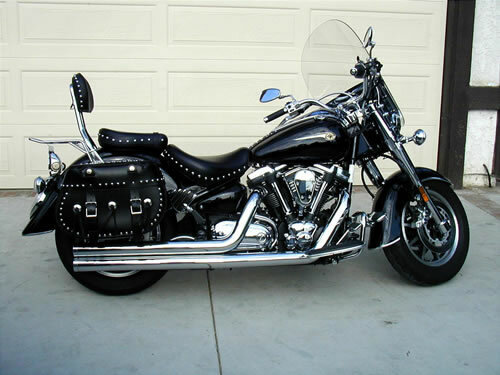 The 110 Saddlebag measures 13"x20"x7" and works best on large struts. 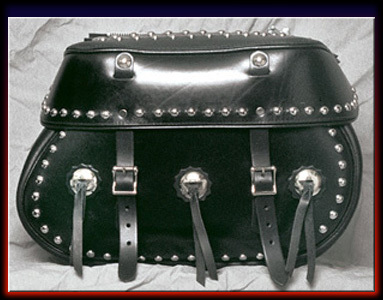 It can be made zipper detachable with a yoke or bolt on ready to work with the Easy Bracket or another direct bolt on kit. On some motorcycles Turn Signals may need to be relocated to the license plate with these applications (for proper fit, turn signals must be off the strut). 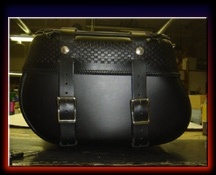 The Leatherworks prides itself on the American Made quality workmanship that is put into every motorcycle saddlebag. You'll also find great classic styling with a rare attention to detail. 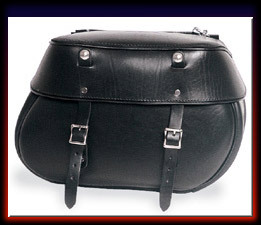 The Leatherworks, Inc., founded in 1976, makes handcrafted Saddlebags with uncompromising care from premium 10 ounce, American-tanned harness and Latigo leather. 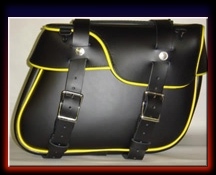 All Leatherworks Saddlebags and Tool Bags are designed to fit on stock motorcycles. We recommend that you allow 1 inch to 1-1/2 inch clearance from the exhaust. All Bags are warranted against defects in workmanship. The Leatherworks cannot be held responsible for damage due to improper fit or improper installation. 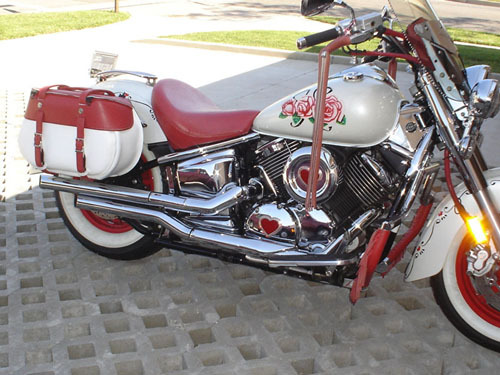 If you are purchasing bolt-on ready bags and are NOT purchasing the Easy Bracket hardware system from us, please let us know, by writing it in the Comments section of your order, what type of saddlebag bolt-on system you intend to use (If you're purchasing Easy Brackets from somewhere else, that's fine, just let us know). Although this information is optional, if we know, then we can make sure you have the right type of reinforcement and perhaps help to intercept any problems. 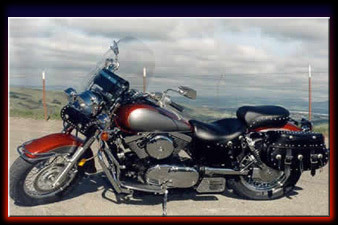 Black Softail, Sportster and Dyna Harley Davidson Turn Signal Relo Kits The kit does not include the outer license plate frame. 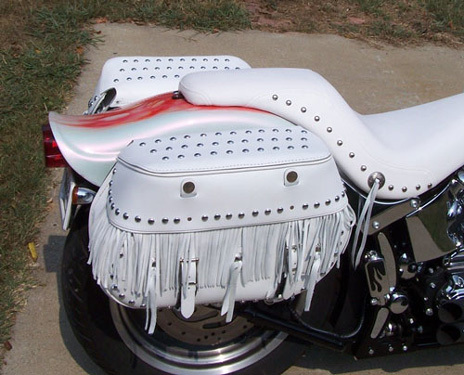 So you want to have a cool looking laid down license plate and relocate your turn signals so you can install those great detachable saddlebag brackets, Easy Brackets. Or maybe you just want to get those turn signals off the fender strut. Now you can do both with one easy kit. Your Shipping Price: $0.01 for Ground shipping for all Relo Kit orders to be shipped within the main contiguous USA only. The kit uses the stock turn signals so you won�t lose the wing standoff. 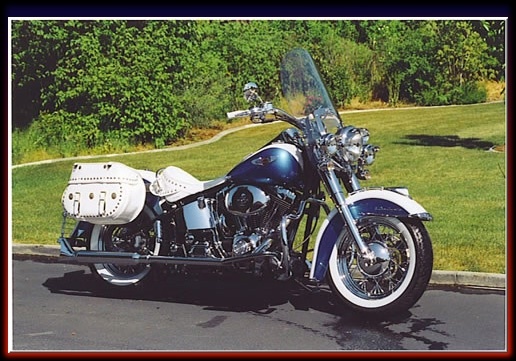 Easy to install, and on most late model bikes you don�t even have to cut the turn signal wires to relocate them. Installation usually takes less than one hour. 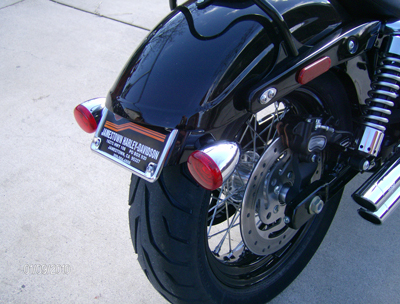 Turn Signal / License Plate Relocation kits are designed to work with US license plates only. Plate size, 4" x 7 1/4" with 1/4" diameter holes, 2 3/4" CTC in the verticle and 5 3/4" CTC in the horizontal. 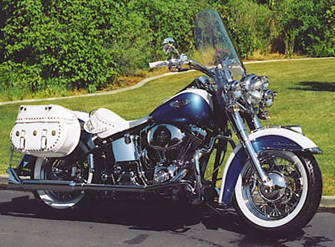 Chrome Softail, Sportster and Dyna Harley Davidson Turn Signal Relo Kits The kit does not include the outer license plate frame. Chrome Harley Davidson Turn Signal Relocation Kits from Easy Brackets Select the Turn Signal Relocation Kit that you want below. 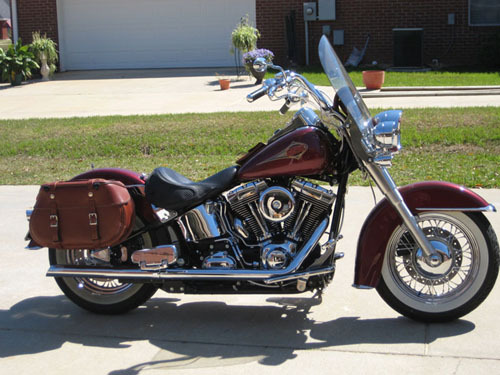 All Relocation Kits come complete except the TSSTLD-03 Kit for 2007 and Later FLSTF which works with Custom Chrome and Drag Specialties laid down license plate mount only. Not provided with TSSTLD-03 kit. The kit does not include the outer license plate frame. Harley Davidson Turn Signal Relocation Kits from Easy Brackets Select the Turn Signal Relocation Kit that you want below. Mounts to the license plate mount for a clean attractive look. This kit only works with the existing wing standoff. 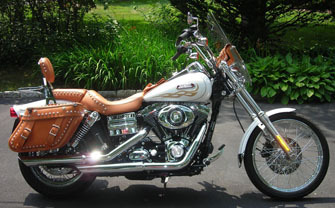 2010 & Later FXDWGI Dyna Wide Glide License Plate and Turn Signal Relocation Kit. It�s lean and mean and makes a statement just like you do. 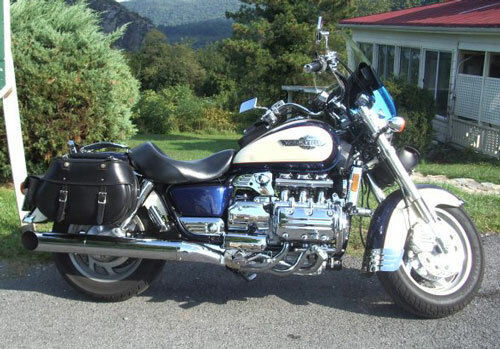 Now you need the one product that will make your motorcycle complete. 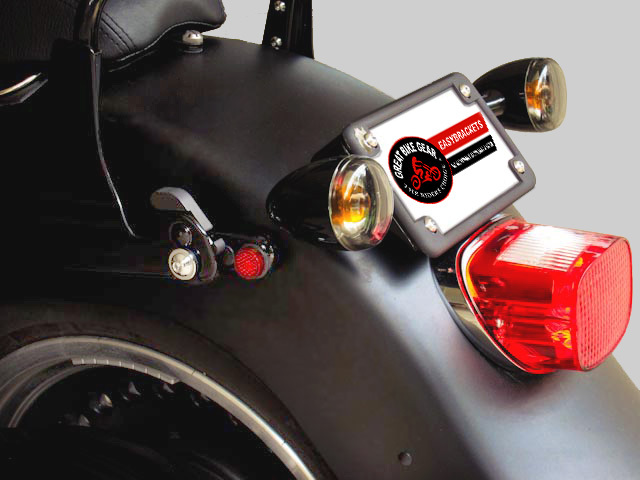 This product relocates the license plate and turn signals which allows you to install saddlebags on your motorcycle. The kit is used with or without Easy Brackets model DNA-L2. Your Shipping Price: $0.01 for Ground shipping for all Relo Kit orders to be shipped within the main contiguous USA only. Turn Signal / License Plate Relocation kits are designed to work with US license plates only. Plate size, 4" x 7 1/4" with 1/4" diameter holes, 2 3/4" CTC in the verticle and 5 3/4" CTC in the horizontal. 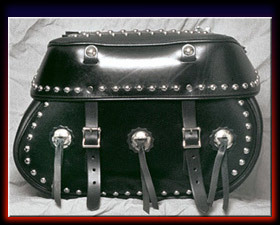 How about this - the system is made from sturdy 12 guage steel and has a high luster black powder finish. It uses the existing turn signals and license plate light. and does not require any wires be cut to relocate them. The license plate light is cleverly tucked up under the fender. 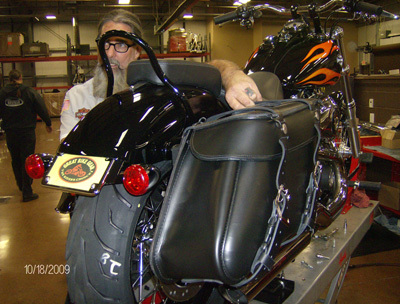 DWGMS-01 Harley Davidson 2010 & Later FXDWGI Dyna Wide Glide License Plate and Turn Signal Relocation Kit from Easy Brackets One of the best features of this system is that there are no damaging modifications required to attach it to your bike. It cleverly makes use of the existing bolt holes. There's no drilling, welding or any of that to damage your motorcycle. 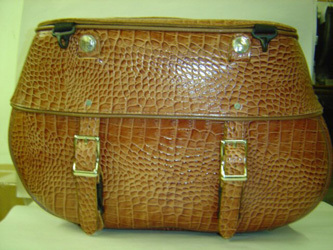 The Leatherworks products have a one year warranty against defects in material and workmanship. Custom Leatherworks orders with colored materials or custom work are non-refundable and non-exchangeable because they are difficult to re-sell. (custom work includes Hand Laced Braiding, Fringe, Basket Weave, locks, Carvings etc.) 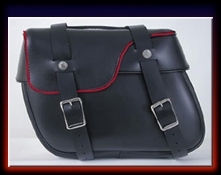 For Standard Plain Black Leather products, we offer a 14 day policy for you to evaluate your order. 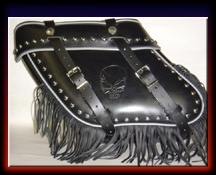 If you have concerns about your order during this period, do not use it, do not mount it or scratch it up, then contact The Leatherworks to discuss your thoughts. If we are unable to resolve your concerns or answer your questions, repack your order in the original box and return it in new condition. The purchase price of the product, less shipping charges, will be refunded minus a 15% re-stocking fee. 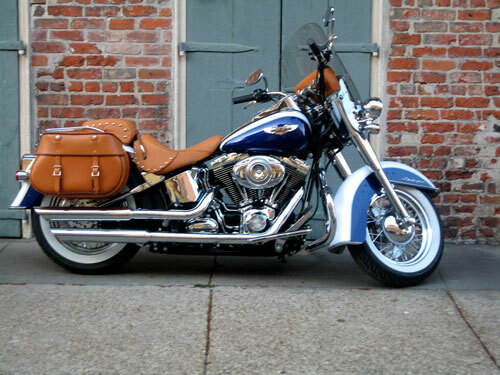 For an even stronger saddlebag with greater structural stability, the Leatherworks has reinforced all bolt on ready bags with ABS plastic that is the full size of the back, not just strips. The plastic is about 0.25 inches thick. 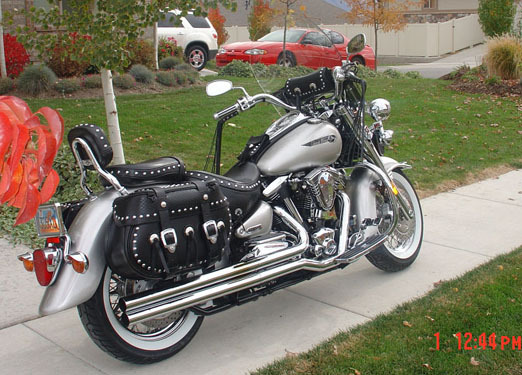 This is done for all bolt on bags and all larger throw over bags, including the 110 saddlebags. 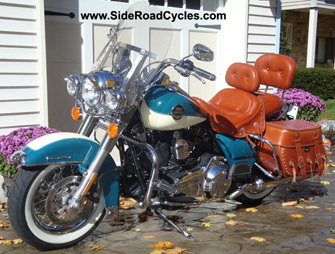 (if you order Easy Brackets from American Side Road Cycles, well make sure you get the proper support). 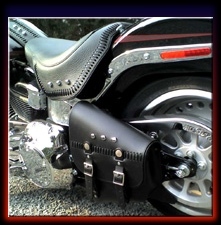 The Leatherworks "Bolt-on Ready" saddlebags have specially reinforced backs. Mounting hardware (bolt-on brackets) is not provided. 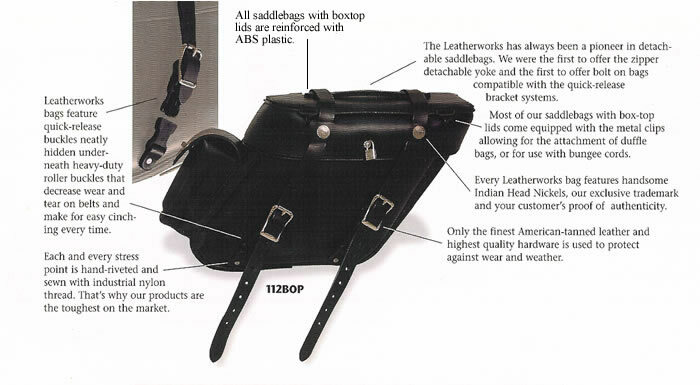 You may purchase this hardware from your dealer, a trusted aftermarket supplier or from American Side Road Cycles - the Leatherworks bags are designed to work with just about any bolt-on system out there. 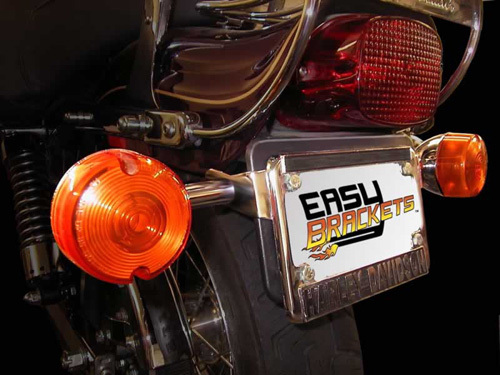 We sell Easy Bracket brand bolt-on hardware systems that you can purchase with the bags or separately. The reinforcements are designed to work with any bolt-on system that is currently on the market. 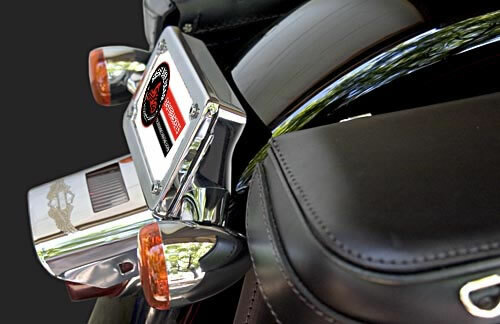 Because the Leatherworks saddlebags are designed to fit multiple motorcycle makes and models, as well as just about any OEM and aftermarket bolt-on system, it is not practical for them to pre-drill the holes in the back of the saddlebags (can you say "Swiss cheese"). 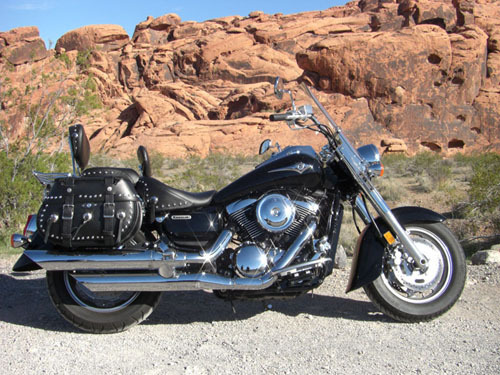 You'll need to do this to properly fit these saddlebags to the bolt-on system you select. The other reason is that everyone has their own preferences as to how high/low or back/forward they want to mount their bags. Because of these preferences and the different systems, we've found it best to not pre-mount anything. 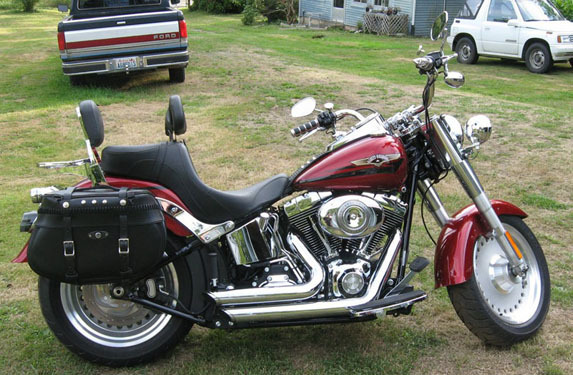 With the use of lowering kits, the main thing is to be sure the bags clear the pipes and axle nuts, which with the Easy Brackets means putting the bracket lower on the back of the bike to get the clearance that is needed. 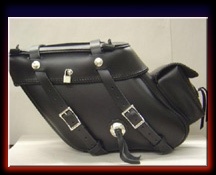 The Leatherworks "Throw-over" saddlebags are designed with an adjustable zippered yoke that connects the two sides of the saddlebag together. On the zipper detachable bags, they have straps across the back which go between the bike and the bag on the support brackets. 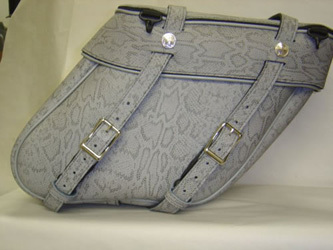 In other words, the support brackets slip between these straps to hold the bags in place. This yoke is designed to go under the seat. 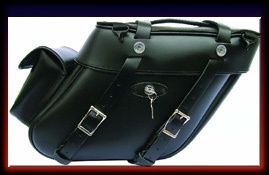 We highly recommend saddlebag supports for throw-over bags. These are fairly common "U-brackets" that keep the bags from getting caught in the shocks, gears, wheels and other parts of the bike. We offer these "U-bracket" type supports from MC Enterprises. 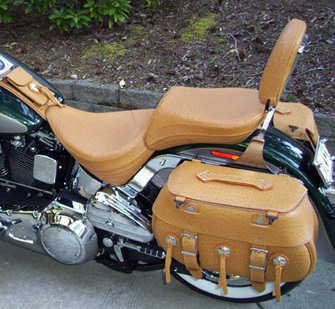 The Leatherworks warrantees do not cover damage caused by the lack of proper saddlebag supports. With the use of lowering kits, the main thing is to be sure the bags clear the pipes and axle nuts.